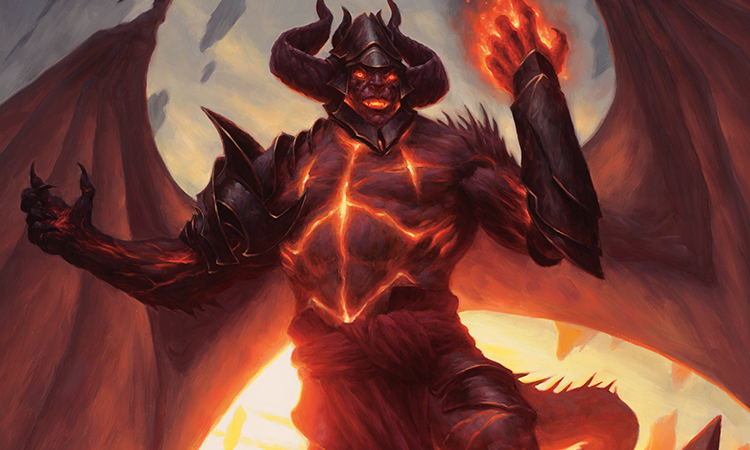 Weeks ago, Chandra Nalaar decided against getting involved with Zendikar's woes. She remains on the plane of Regatha, where she has accepted the position of abbot for a monastery of pyromancer-monks. Her thoughts often stray to the battle currently raging on Zendikar, the pain her friends might be suffering there—and the help she could be providing. But she has made a promise to fulfill her duties on Regatha, and a promise is a promise. Sleep wasn't forthcoming, and wasn't an option anyway. The quill was in the same place she had left it—jammed headfirst into the masonry. Chandra felt her brain trying to writhe out of her skull. Tomorrow she would give the traditional Mount Keralia Address. Tomorrow she would impress Mother Luti and all her students with a well-planned litany of self-assured pyromantic demonstrations, some rousing words that probably evoked their beloved Jaya, and maybe some fire-based metaphors. She would prove herself worthy of being the abbot of Keral Keep, as every abbot had since the beginning of time, probably. She flopped back on her bed in her abbot's robe, staring up at the ceiling of her bedchamber. This is the life you've chosen, she reminded herself. She had made a promise. No matter what was happening on Zendikar, no matter how much they might need her, no matter how freeing it might be to be part of that battle. This was her role now. She regarded the quill stuck in the wall, and slowly her eyes shifted to the door. She stood and walked to the doorway. She leaned out, glancing back and forth down the corridors of the Keep. Shadows danced from flickering braziers: the night lanterns. The Keep would be silent for hours. This is what keeping a promise feels like, she told herself. You're not a child anymore. This is taking—she balanced herself against the doorframe with one hand and forced herself to think the next word—responsibility. She bit her lip, standing in the doorway, checking back and forth along the hallway once more. Then she closed the door of her chamber firmly. She glanced down at the unwritten speech, and at the almost-untouched pot of ink. She planted her feet and cinched her abbot's robe around her waist, and glared straight ahead at the opposite wall. Just one peek, she thought. She pressed her will against the whereness around her, forcing it to change. Zendikar. Her bedchamber dissolved. The walls became humid night air. The stone floor became a pebbled slope. The ceiling became a dark sky strewn with floating land masses and tilted diamond shapes. She crouched instinctively. It had been hundreds of days, maybe a thousand, since the dirt of Zendikar had smudged her face. She could still smell the rich earth, the untrammeled purity of the place, the crisp edge of warning on the air. But there was something new—a smell of dry dust. A drained smell. Her heart pounded. She wiped her palms on her ceremonial robe. She felt suddenly unprepared, ill-equipped for Zendikar's vast danger. It stole her breath away. She was surrounded by twirling-trunked trees and spiky crags. She hurried to high ground to get a glimpse of where she was. The land fell away before her, leading down to a shimmering sea. Beyond the sea rose a city of white stone towers—Sea Gate! She had managed to planeswalk close to her goal, close to where Gideon had said to find him. The white towers were anchored by a mighty seawall, and over the sea floated a semicircular collection of hedrons, their runes glimmering in the night, reflecting in the tips of the waves. In the distance, Chandra saw a strange, vast silhouette on the horizon that she didn't recognize. It was probably one of Zendikar's gravity-defying mountain ranges or monumental landforms, distorted into enormity by the dim light. And just below her, at the base of a cliff, were people. Some of whom she knew. Gideon was shouting directives, looking as natural in a leadership role as in his armor. "Careful now—that's good," Gideon was saying. "All right. Gate team, pull!" Chandra followed Gideon's eye line. One of the larger hedrons, hovering over the water, was moving. In fact, she could see teams of figures guiding it along the surface of the water, hauling it through the air with heavy ropes and nudging spells. Kor ropeworkers along the seawall pulled on their guidelines, shepherding the hedron gradually into place. "And—halt it there!" Gideon shouted. A second team pulled in an opposite direction. The moving hedron slowed to a halt in its place in the circle. "Placement's good," Gideon said. "Altitude's good. Next team, prepare your lines!" They're doing it, she thought. My friends are doing it. They've come here, and they're helping. They're saving this world. Chandra made an involuntary fist-swipe of pride—causing her to stumble with vertigo at the cliff's edge. She caught herself, but a cluster of pebbles tumbled down the trail behind her. "Eyes on! Eyes on!" came a woman's shout from above her. Chandra ducked down between two curving trees, glancing her head against a bough, and looked up. Overhead flew a scout: a sky-manta's broad body gliding through the air, with an elf woman at the reins. The manta pivoted sharply, and the scout peered down across the area where Chandra hid. "Movement in the trees, that way!" the elf called down. She heard Gideon reply from below. "Take another pass," he shouted. "I need to know how many, and how big." The manta rider began a wide turn to double back to Chandra's position. Chandra only had moments before the scout's sharp eyes would discover her. Chandra wasn't here to stay. Just one peek. Chandra dashed down the trail she had climbed up, half-skidding down the slope. She began to slide on the loose rocks, and managed to catch herself on an arc-shaped crag—only to run into another species of trouble entirely. When she stopped herself, she was face-to-faceplate with a trio of angular, meaty-ribbed, bony-headed creatures. They had the unsettling impression of wearing their insides as their outsides. 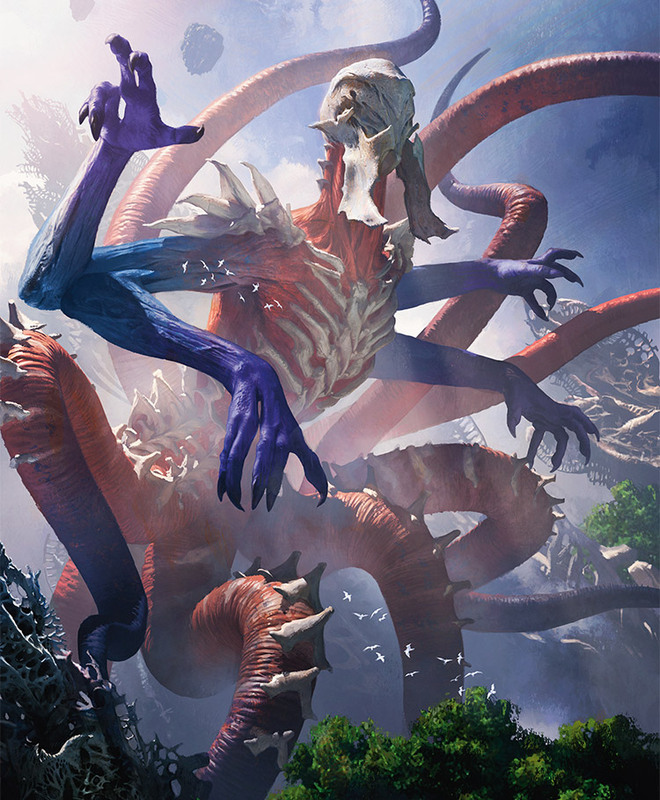 Eldrazi. These were Eldrazi. The creatures that afflicted this world, that Gideon and Jace had asked for her help in fighting. The largest one let out a rattling, whistling hiss, and the others answered in kind, moving toward Chandra. "No, no, no," she whispered. Chandra glanced up. The elf scout was swinging back in her direction, but had not yet completed her turn. She looked back at her opponents just in time to see one of them slicing at her face with a bladelike leg. She dodged, but another of the Eldrazi was upon her, pinning her arm against a boulder. She ripped her arm free, but the third leaped on top of her, grasping at her jaw and hair with slimy pincers. "Manners!" she murmured, grabbing a handful of sternum and hurling the creature off of her. The largest one collapsed onto her, forcing its weight down onto her shoulders, adding to the weight of her robe. 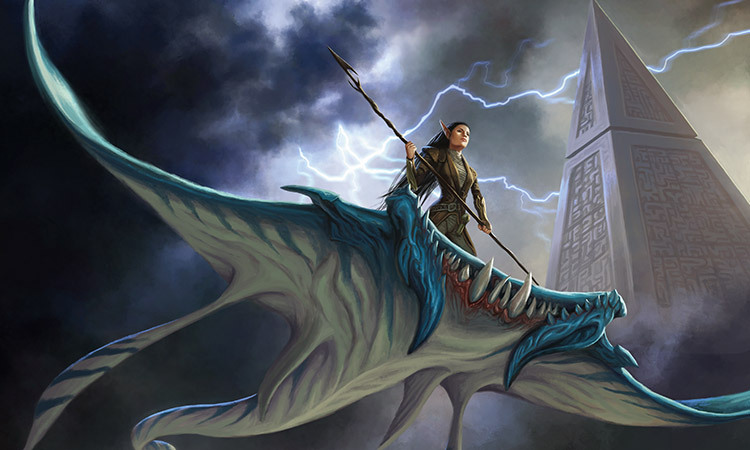 She felt the Eldrazi's serrated front limbs trying to immobilize her—or crush her flat. She grunted under its weight, trying to maintain her footing. Her spine bent painfully, and she fell onto her knees. She pushed up at the creature's legs, and its spines sank into her hands. Still it pressed down, and Chandra's grimace of effort became a snarl. She summoned all her strength, set her feet, and shoved back at it. The thing tumbled off of her, and she was free for the moment. The sky manta passed over her. Had the scout seen her? The elf scout whistled, and the flyer wheeled again, sinking lower as it turned back toward Chandra. There was no time. 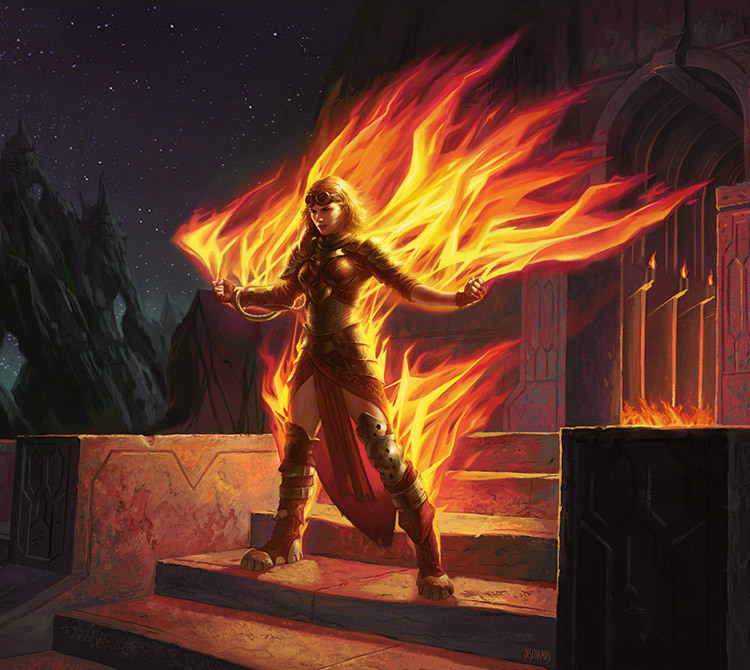 Chandra eyed the Eldrazi creatures, and felt her skin prickle with heat. She tucked and spun her body, and the spin became rage, and the rage became fire. She emitted a dome of flame, pushing out from her body in all directions. For a moment all she saw was the flash of her own fire, but then she saw the night around her again, and the creatures were on their backs, but still alive. Their scorched bodies and legs scrambled for purchase. No time no time no time. They clambered upright and rattle-shrieked at her. She crossed her forearms in front of her, built up mana from the mountain under her feet—and slashed her arms out to her sides, creating a tripartite blade of fire that sliced through each one of them. The creatures went still, each one silently wafting smoke from its own personal grave-crater. She squeezed her fists in triumph. She half-shouted out, but caught herself and slapped a hand over her mouth. She glanced up again, sidestepping back under the tree line. The elf scout passed over her, eyes glued to the smoking Eldrazi corpses. Her body trembled, a drumbeat of dread and exhilaration hammering inside her. She pressed her back against a tree trunk, covering the reflective glass of her goggles with the sleeve of her robe, hoping to stay hidden. That's it. That's all I came for. Just to know they're safe. Just to know—that they don't need me. She began her planeswalk back to Regatha. The landscape of Zendikar began to melt around her. She allowed herself one more glance back at Gideon and the others. That's when she saw that shape on the horizon—the thing she had dismissed as a floating landmass or irregular mountain. In the first rays of predawn, she could see that the giant shape on the horizon moved. It slowly undulated its limbs, which meant it had limbs. Its twin jawbones shone pale and jagged in the night. It wasn't just looming. It was approaching. It was heading toward Sea Gate, toward Gideon and the others, carving its death-path across the world. It threatened to destroy all life in its way. The creatures she had fought—those were insignificant compared to this monstrosity. This—Ulamog—this was what the true battle was about. This was what caused that death-dust smell that was new to the world, and what her compatriots were risking their lives to confront. This was what she had helped unleash. —But the image of Ulamog dissolved, an undulating shadow on her retinas. She was already planeswalking away from there. 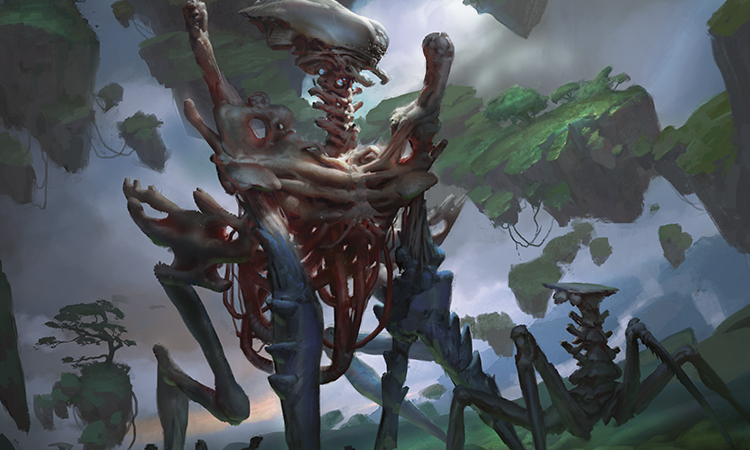 Regatha faded into existence around her, replacing the stretch of land that led to the hedrons, that led to her friends, that led to the Eldrazi titan. Her bedchamber brightened as it formed around her, morning light streaking in the windows. The sound of urgent knocking at the door came to Chandra's ears as the world resolved. The door jerked open, and Mother Luti's irritated face emerged. To Chandra, it looked like she was shimmering through a still-lingering afterimage of Ulamog. "Chandra?" Mother Luti scolded. "Are you ready? The Address! The chants have already started!" "You will not shirk your responsibilities here, Abbot Nalaar," said Mother Luti. "You will not break your promise." With that, Mother Luti stormed off down the corridor. Chandra slowly closed her mouth. She was still wearing the robe—Serenok's robe. The embroidered mantle had a tiny tear in the sleeve now, from where an Eldrazi's serrated pincer had lanced into her bicep. Swimming in a surreal fog, she walked two steps, bent down, and picked up the sheaf of parchment pages: her speech. MY INSPIRING ORATION, the top page read, scrawled in her own hand. BY ABBOT NALAAR. She looked at the door. It led to the rest of the Keep, to her students, to Mother Luti, to Regatha. Her feet just didn't know how to move toward it. Suddenly she crunched the pages into a clumped ball in her hands. The pages burst into flames, burning up in a flash. She let them drop as flakes of ash out of her fingers. This is what it feels like to keep a promise, she thought. She stepped out of her room, the form of Ulamog still imprinted on her mind. The abbot greeted her students with a nod of her head. So many faces looking back at her across the great hall of Keral Keep. Mother Luti looked on from the back. "Good, um, morning," she said. She clung to the stone obelisk that acted as her podium, trying to remember how words worked. She coughed into her robe's sleeve. She furrowed her brow, trying to recall some Abbot Serenok sayings. "Fire is a symbol," she said stiffly. "For the—well, fire. In all our hearts." Somehow that had come out better when Serenok said it. Monks looked at one another. Somebody cleared their throat. "We must be sure to..." she trailed off, looking at the podium in front of her. "Stoke! That fire. So that it. Uh." She glanced up and saw Mother Luti's face. That was a mistake. Chandra rubbed her temples with her forefingers. She coughed. She took a breath. "Look," she said. "When I came here as a child, I was a mess. I had no idea what to do with this thing, at all." She raised her hand, and it blossomed with fire. She shook her hand and the fire went out again. "The people of this place—Abbot Serenok, Mother Luti, all of you—you showed me. You didn't try to control me. You didn't try to change me. You taught me how to express who I was in my own way." She looked out at the dozens of individual faces before her. "If there's anything I can do to repay that favor, it's to encourage you to do the same thing. Each of you is a separate, individual you. You are not the fire-monks of Keral Keep, not really. You are not the devotees of the teachings of Jaya. You are not here to listen to me or any other abbot. You are a unique person, with wild ideas about what's truly important. You're only here because it's a place where you're allowed to find out who you are." Am I really saying this, she thought. Am I saying what I think I'm saying? Chandra looked for Mother Luti's face, but couldn't find her in the crowd anymore. "I'm sorry to those I'm disappointing right now," Chandra continued. "But the best way I know to honor the tradition of the Mount Keralia Address is to tell you to stop listening to this Mount Keralia Address." The monks looked at one another again. Chandra undid the belt of the abbot's robe, pulled her arms out of the sleeves, and shouldered out of it—she wore her usual armor underneath. She let the robe hang from her hands, gently, the way one holds an important treasure that was meant for someone else. "Each of you has a gift that only you can bring to the world. A way you can help that others couldn't. And the way you express that gift is to hear this: trust yourself. Trust your gift. Don't put all your reliance in speeches, from me or anyone else." Some of the monks slowly stood. Heads nodded. She saw the sparkle of a few smiles. "There are purposes for you out there, more important than a tradition or an address," she went on. "Crises that you should be part of right now, problems that won't be solved without you. I urge you to go. Go and find out what they are." She bowed her head, raising Serenok's robe as a kind of salute. "Thank you." Many monks shook their heads, mouths curved in disappointment. But a few others cheered and threw up their fists. She felt them come alive, saw their eyes awaken, in ways she hadn't seen in weeks of routines and metaphors. "Thank you," she said, blinking through tears, cradling the robe in her arms. "Thank you so much for all you've done for me. Thank you." Chandra smiled and turned away from the podium. She ran into a wall of Mother Luti. Chandra's smile faltered. "I'm sorry, Mother Luti," she said. "But you know I have to go." "This is how you feel?" Mother Luti asked evenly. "This is what you want?" 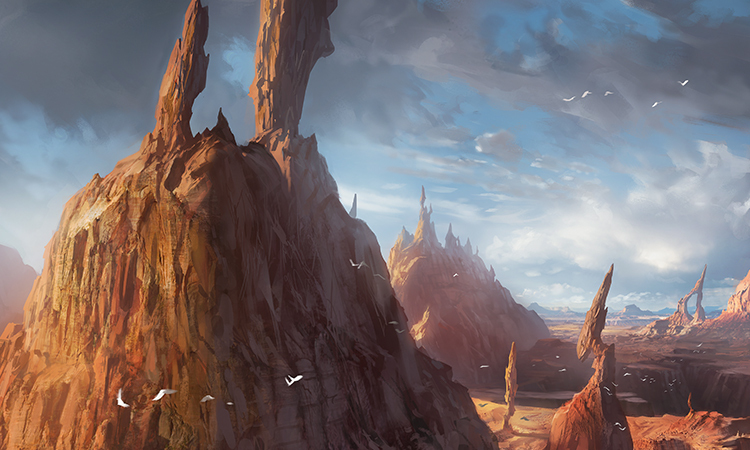 "I'm going to Zendikar," Chandra said. "I'm needed there." Chandra looked in Luti's eyes, and immediately she saw the pain her departure would cause. She saw how she would be abandoning this place, the place that had welcomed her in, the place that had believed in her and helped her become herself. Mother Luti's face was unreadable. "You're not sure," she said. "Is this the truth of your heart?" Chandra saw the phantom of Ulamog flickering at the corners of her vision. "Yes, I believe so." "Not acceptable," Mother Luti snapped. "You are needed here!" "I have to go," Chandra said. "Listen, I'm sorry I have to leave you—I know this leaves you without an abbot, and I've appreciated everything—"
Mother Luti cut her off. "I'm sorry I have to do this. But I must remind you of your promise. You will be staying on as abbot of this Keep." "You committed to this place. You considered leaving, but you decided to stay. Get the students back. You will deliver your oration and you will teach pyromancy." Chandra's brow lowered. "What are you saying?" Mother Luti was deadly serious. "I forbid you to leave." Chandra's hands squeezed into fists, but she forced them back open again. She shook her head, chuckling. "Now, look, I—"
"Chandra, need I remind you? Even though you are abbot, I rank higher than you. And I say that you will stay." Fists. "I am not staying." "You are and you will." "I do have a responsibility!" Chandra shouted. She jabbed a finger into the air, pointing anywhere. "There are people suffering out there right now, and I can help them. I can help. I can't stay here and repeat exercises endlessly, knowing that I could go out and use what you've taught me to prevent a disaster." Mother Luti's face suddenly glowed with quiet pride. "Now you're certain," she said softly. "Congratulations, Chandra." "Now you know the truth in that head of yours." "That's—that's what you needed to hear?" "That's what you needed to know." Chandra's shoulders dropped. She wiped at a droplet that was forming unbidden in the corner of her eye. "Thank you," she said. Mother Luti reached out to accept the abbot's robe, but Chandra slammed into her for a hug. Chandra felt Luti hesitate, then squeeze her arms around her. "Go, Chandra Nalaar," Luti whispered into her hair. "Go and save worlds." "I promise," Chandra said inaudibly. Chandra released her. She gathered up Serenok's robe and folded it carefully. Then she folded it again a different way, and then refolded it again and furrowed her brow at the third asymmetrical crinkled mess she had created. She began folding it once more, and then smiled as Mother Luti gently took the mantle from her. "It's fine," Mother Luti chided. "It's fine." Chandra turned, and many of the students applauded. "Goodbye," she said. "Goodbye. I hope to see you all again one day." 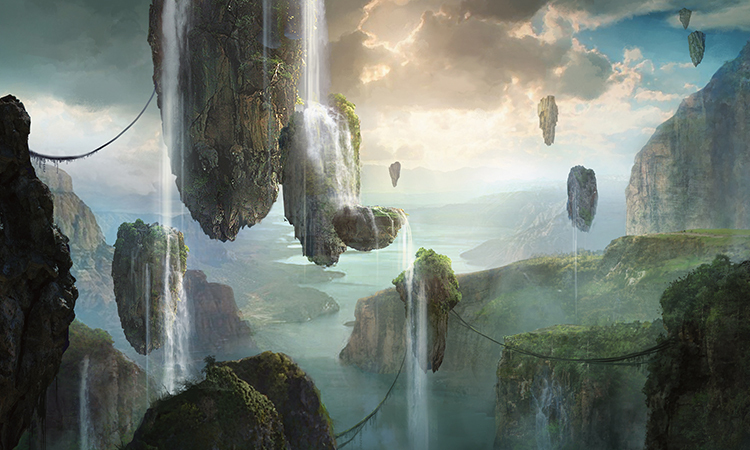 The air smelled of dust on Zendikar. But she had hope—it smelled of salt water as well, so she wasn't far. She had emerged somewhere in the forested area by the coast, but she could see the towers of Sea Gate rising over the trees. She also saw Ulamog. He had reached the city already. His monstrous head rose higher than the towers, its bony jaws and bifurcated arms threatening the city. She hoped she wasn't too late. The seawall was close, just down a tree-covered slope. A small squad of Eldrazi creatures dropped out of the branches in front of her, rattle-hissing and brandishing spiked limbs. But she threw a spell with a spin and a lash of her arm, and the creatures turned to ash in a blur of fire magic, and she shoulder-rammed through their charred forms. Chandra ran to the edge of the seawall. She struggled to take in what she was seeing. Chandra could see the titan thrashing inside a ring of hedrons, unable to move beyond them. All around her, elves and kor and goblins shouted, jeering at the incapacitated titan. Alarmingly, an eight-armed sea creature was emerging from the waters, but Chandra saw that it was using its limbs to slap at various Eldrazi stragglers. It was helping, too! She could barely see a merfolk mage directing the octopoid monster with her two-pronged spear. Chandra's heart leaped. She ran back down the seawall, dodging past smiling and hugging Zendikari people, continuing to try to look over the seawall. She was eager to find faces she recognized, but she couldn't place Jace or Gideon. The moment she spied the winged shadow skimming over the water, time seemed to slow down. When she raised her gaze to see the hell-veined demon, a pang of dread started in her gut and flooded through her entire body. She saw the demon rear back in the air with a flap of his powerful wings, pausing over Ulamog's prison. She saw the demon reach down with clawed fingers, as if drawing power toward him from far below. He spoke unintelligible words, and she felt the earth shudder. Around her, cheers quieted to murmurs of concern. The tips of the hedrons were aimed at the demon now. The hedron prison had become some new form of hedron device, a vortex of power with the demon at its apex. Veins of dark energy slashed forth from the hedrons, converging on the demon. His body arched, taking in the power, and his head was flung back. He laughed a deep, satisfied laugh, floating there in the air above Ulamog's skull. Demons laughing, she thought. Never good news. 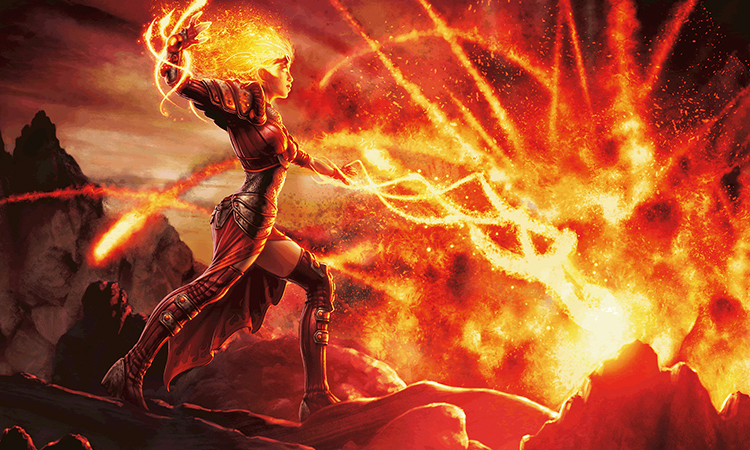 Chandra spit in her hands, rubbed them together, and conjured an unreasonable amount of flame from nowhere. Three separate fire spells at once should do it. She twisted her body and spun with a grunt, hurling a barrage of pyromancy all at once at the demon. But as her spells sped toward the dark leylines, they became entangled and engulfed in the lines of force, and the flames dispersed without reaching their target. The ground shifted, and around her murmurs became screams. She looks down to see the hedrons of Ulamog's imprisoning ring tilt and tremble. The ground rumbled with more violence, rocking the seawall and churning up enormous waves. Zendikari people stampeded along the seawall in raucous panic. Waves surged and splashed over the seawall from the Halimar side. One particularly huge surge loomed high, cresting forty feet above some running refugees. Chandra blasted the wave with a cone of heat, sizzling it to steam before it could crush them and inundate the seawall. She ran with them, beating back the gushing seawater with waves of pyromantic air. As Chandra ran with the crowd for lower ground, she looked up to see the tops of Sea Gate's towers swinging to and fro. A crack formed in one of the spires, showering white dust and debris down on them. As the demon's empowerment spell ended, gravity began to take hold of the hedrons down at the water's surface. The hedrons fell, splashing down into the churning sea one by one, snapping the rope lines that connected them to each other and to the wall of Sea Gate. The circle was breaking. The structure of Ulamog's prison was rupturing. No longer restrained, Ulamog unfurled like an apocalyptic flower. The titan grasped at nearby fleeing humanoids, who turned instantly to dust. Chandra screamed in rage. She whipped missiles of fire at Ulamog, but they seemed to do nothing. She still couldn't see Gideon or Jace in the crowd. She wasn't able to stop the demon or damage the newly-freed titan. What else could go wrong today? The rocky peninsula at the far end of Sea Gate shuddered, then the land broke with a snap. Rock and earth fell in on itself, a self-swallowing sinkhole. The sinkhole spread in an unnatural way, the edges of the hole bending and retracting inward, the terrain forming bizarre right-angled patterns with an iridescent sheen. There was movement of something massive deep underground, surging toward the surface. OF COURSE, she thought. WHY NOT? WHY NOT THIS NOW? Gigantic, angular shards of a shimmering, obsidian-like material stabbed up from the ground. As the being rose, Chandra saw that the shards floated in formation above a great swiveling globe of a head, which was embedded in an armored, split-limbed torso, which was supported by a forest of chthonic tentacles. As it rose, it shed earth like a doffed robe, terrain tumbling from it and raining down into the sea. This was not merely an additional Eldrazi creature to fight. This was the advent of another god-thing, like Ulamog—a horrific divinity of the Blind Eternities. 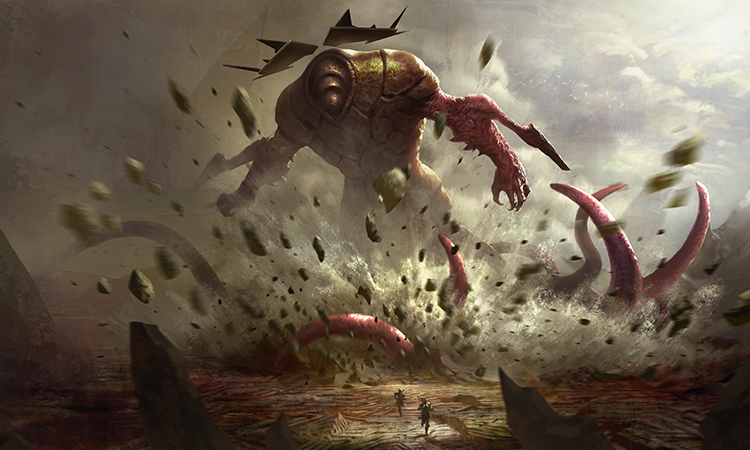 A second Eldrazi titan had entered the battle.